A weekly newspaper is celebrating 50 years since it was the first to publish colour photographs as part of a normal print run. The paper had been taken over by Labour MP Woodrow Wyatt, having previously been owned by Ted Clark who had built the paper up over ten years and increased circulation to 12,000. Writing in this week’s paper Michael Guy who started his career as a reporter on the Guardian and was later editor-in-chief of Woodrow Wyatt Newspapers, recalls the event. He said that rather than becoming the owner of just one local newspaper, Woodrow bought the Marlborough Times and the Wallingford News. But these did not satisfy him either. No companies in the UK he did this so he used one in Chigaco called Goss Suburban Press. He also built a new print centre with other major changes including headlines being typeset and pages pasted up instead of being made up on hot metal type. Added Michael: “And so to the famous evening in March, 1962 where the pressroom manager, Carl Yates, nervously prepared for the historical occasion. There followed some argument as to who was the first to produce newspapers by the new web offset process in the UK – Woodrow Wyatt or Morley Tonkin in Welshpool. Most gave it to Woodrow and from that night he went on to launch full-colour newspapers in Swindon, Wiltshire, Coventry, Birmingham and Teesside before he and his wife, Lady Moorea, were divorced and he had to pay her back the money she had put up to finance his dream of building up a chain of local newspapers. Added Michael: “He told me it had broken his heart when he had to sell the Banbury Guardian. He had bought it for £60,000 and sold it for more than four times that figure. So, at least he had some compensation. 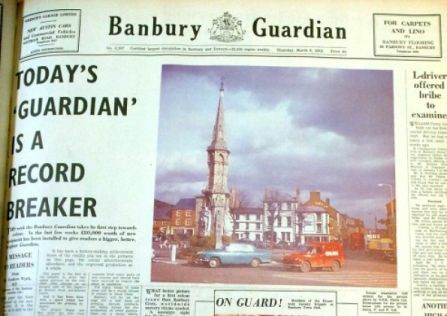 “Nobody, though, can take away his or the Banbury Guardian’s record of pioneering the web offset process of newspaper production which has since transformed the way newspapers have been produced in this country. “Now, web offset is the way almost every newspaper in the country is produced. A worthy claim to fame. Now that brings back memories! I remember working with Mike Guy when I had jobs with the Woodrow Wyatt empire, There was the Coventry Express and the Birmingham Planet. Of course that was back in the days when newspapers were exciting! We had a lot of fun then and did a lot of hard work as well. But it was a pleasure to go into work.